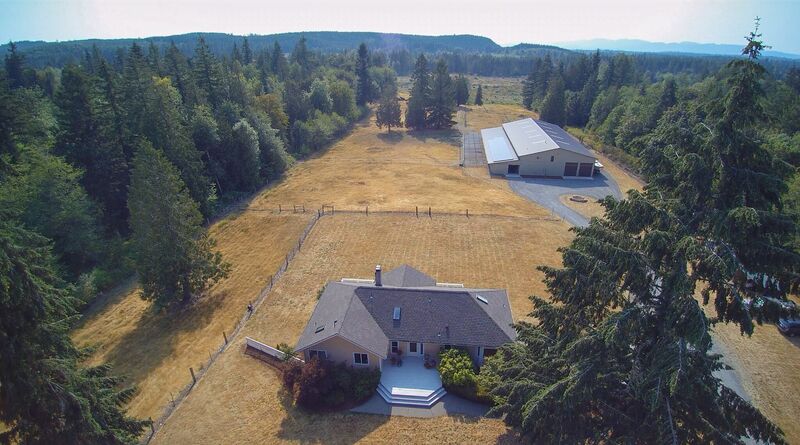 If you have horses and dream of having a beautiful home, your very own arena, photo-worthy views of nature, and nearby trails to explore, this must-see Tenino property is all of that… and more. “The property [originally] appealed to me because I’m a competitive trail rider, so I loved the miles of adjacent trails,” shares the owner. 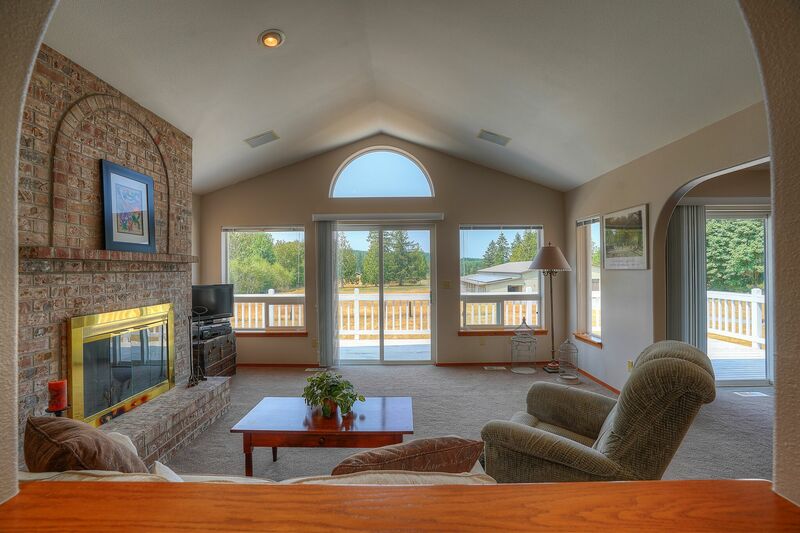 In addition to the bucolic setting, you’ll find state-of-the-art amenities at your fingertips. 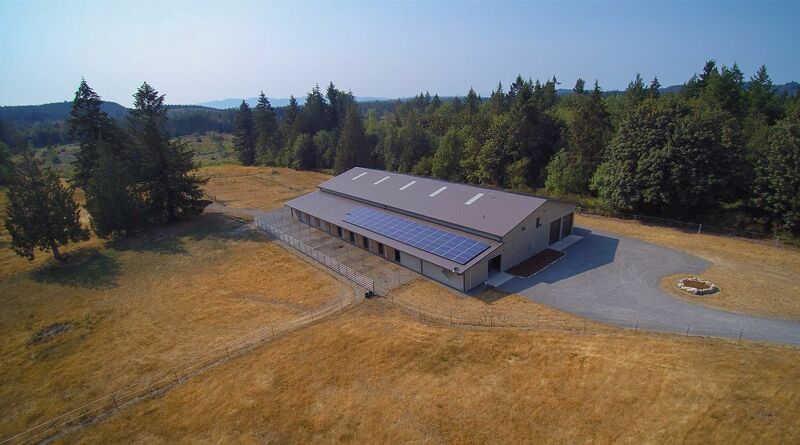 The 60’ x 120’ indoor arena and show barn with nine 12’ x 12’ matted stalls are under the same roof, and the stalls include direct turn out to 12’ x 24’ Noble panel paddocks. 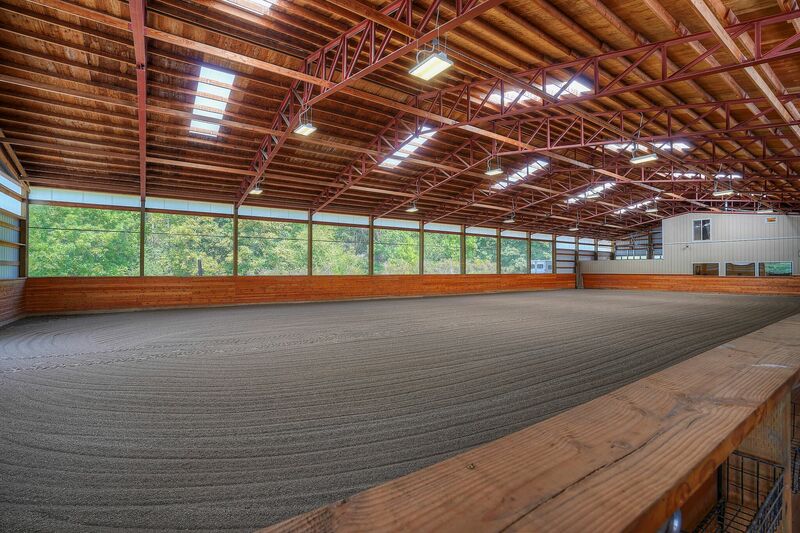 The indoor arena features laser-leveled footing, washed sand and alder sawdust with a clay base, a steel vaulted truss system, tongue and grove fir-lined walls, a plywood sheeted ceiling for noise reduction and extra stability, mesh “gale shields” for an exceptional outdoor view on the north side, and LED lighting throughout. You’ll also find a 20,000 watt solar system (a $60,000 investment!) installed on the arena roof. This powers both the house and barn, with an annual return of approximately $5,100. 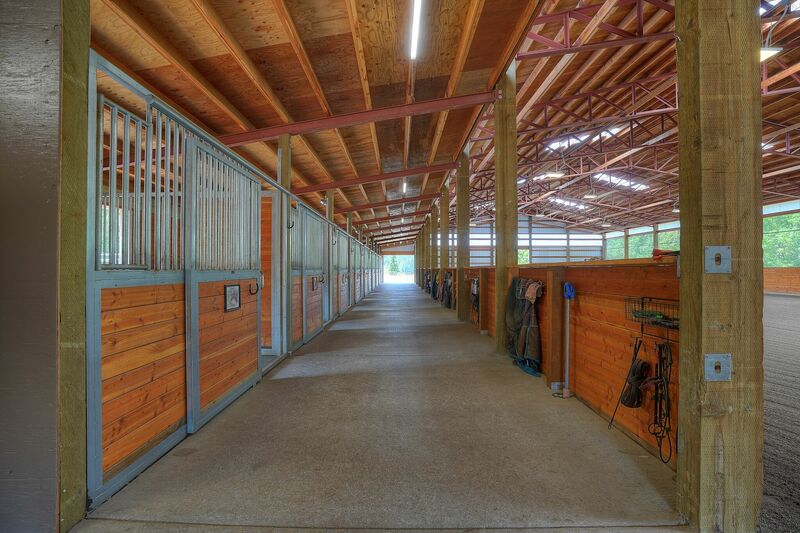 In addition to the show barn’s 9 matted stalls with direct turnout, it includes Noble panel stall fronts and dividers with tongue and grove fir, a separate blanket bar and groom caddie for each stall, a wash rack with hot and cold water and overhead radiant heaters, 2 separate heated tack rooms and upper blanket storage, a heated viewing room, a heated half bath, a utility room with a washer and dryer, heated storage/bonus area up above and separate bays for shavings and up to 8 tons of hay with 14’ roll-up doors for easy access, and a $20,000 drainage system with underground dry wells (zero mud!). 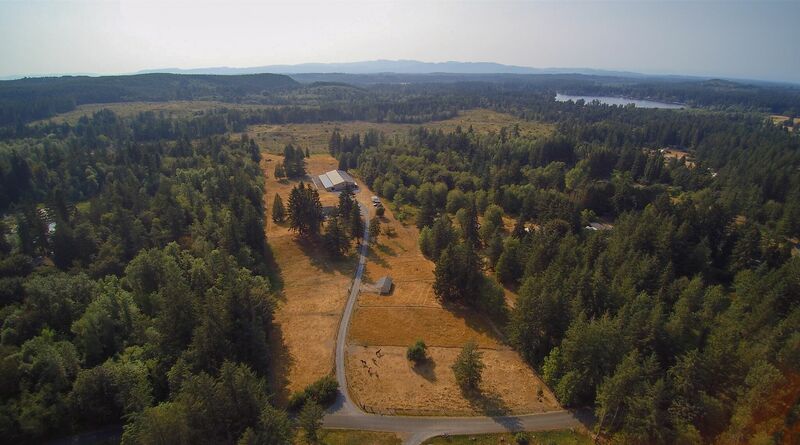 This property also features picturesque grounds to take advantage of, and you’ll find 18 separate pastures for year-round grazing (9 pastures in front of property & 9 pastures towards the back of the property), and a spacious, low-maintenance yard. A separate 2-stall barn, a 2-bay equipment shed, and sweeping territorial views await as well… not to mention the miles and miles of scenic trails that surround the property! When it’s time to head inside to relax or entertain guests, you’ll find a dynamic blend of comfort, convenience, and elegant style. This custom home’s 2,680-square-foot layout includes highlights like a fully finished daylight basement, a master suite on the main floor (which includes a 5-piece bath, a large walk-in closet, and direct deck access), forced air, a built-in vacuum system, built-in speakers, an oversized 2-car garage with separate automatic doors, and a long list of updates. 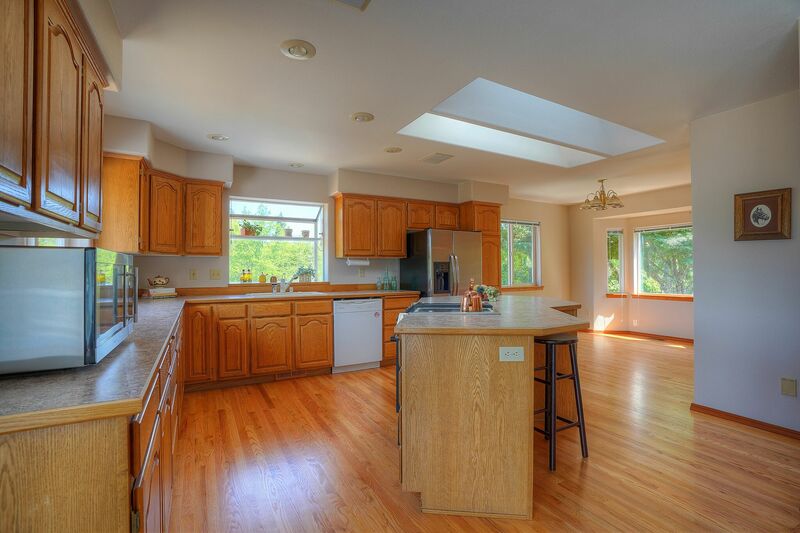 A new 40-year roof was installed in 2017, and you’ll also find an updated kitchen, fresh interior paint, new window coverings, new refinished hardwood floors, and more. 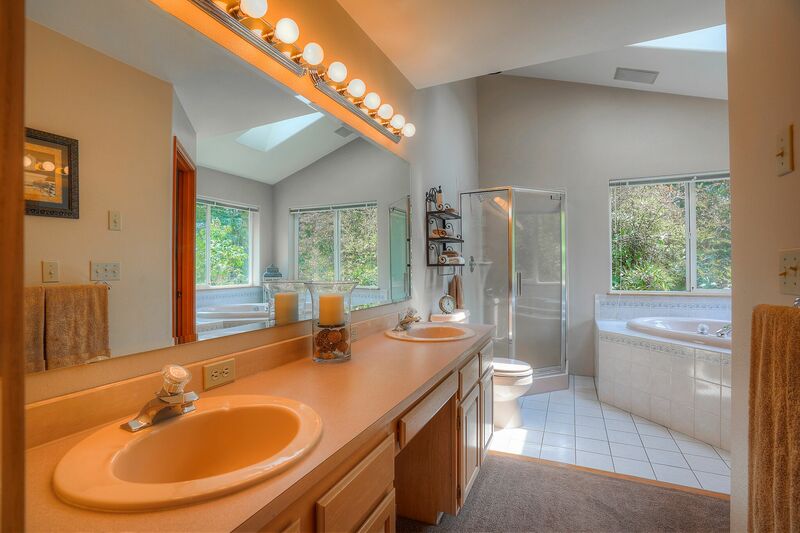 At 12627 Marshall Road SE Tenino, WA 98589, not only are you nestled in a private, wonderfully secluded area, but you’re conveniently located right between Seattle and Portland and off of the Interstate-5 corridor. In addition to the quiet setting and friendly neighbors, one of the perks of this home is the fact that it’s surrounded by trails ideal for horseback riding. The Chehalis Western Trail runs north/south and links up with the 14.5-mile Yelm-Tenino Trail, and offers access to over 170 acres of park land. This trail is a true Northwest treasure! The Offut Lake Resort is also nearby, and this family-owned campground offers cabins, camping, a lakefront restaurant, dock fishing, boat rentals, and more. Interested in learning more? Click here to view the full listing! You can also contact REALTOR® Linda Solheim online here or give her a call/text at (253) 279-7665 to schedule your private tour.